The handicrafts sector has a rich and diverse meaning for the world. It comprises centuries-old traditions with production techniques passed down from one generation to the other, gathering people who have a unique talent and passion for handmade work. When we look at the WFTO family today we are proud to see some of the most inspirational Fair Trade organisations in the world, led by people who have proven themselves as Agents for Change. One of these Agents for Change is the founder of Cards from Africa – Chris Page. Chilean WFTO member Comparte is the recipient of 2015 Social Innovation award for their work in rescuing traditional Chilean crafts, and empowering small artisans under Fair Trade terms. Given during a ceremony last 26 August, the award is given by Price Waterhouse Coopers, and the selection was chaired by Chile’s Ministry of Economy. Read more here. From 15 to 19 August, members of the World Fair Trade Organization and Fair Trade Federation (FTF), our North American Fair Trade network, will be participating at NY NOW with lots of new and exciting Fair Trade products. NY NOW is one of North America’s biggest trade fair shows. 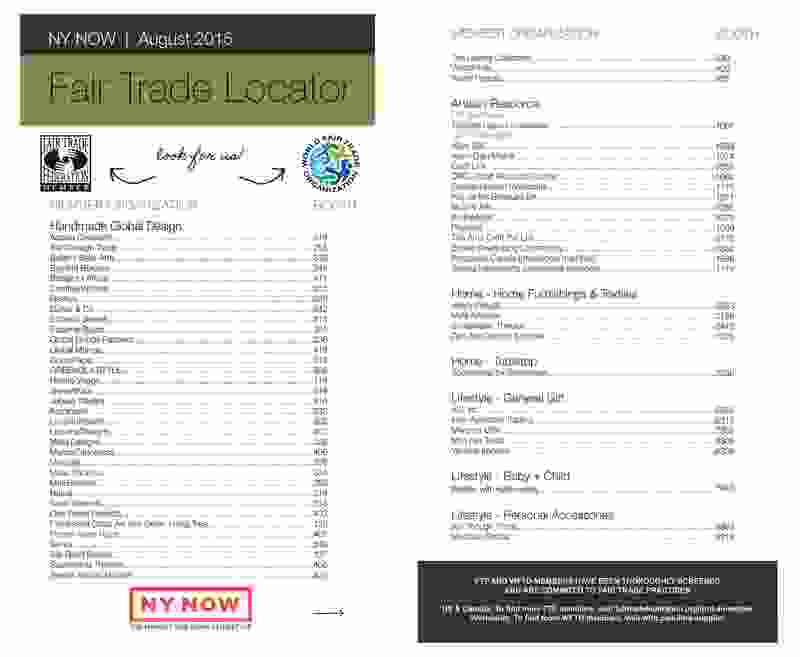 If you happen to be near the New York area, please visit NY NOW and use our Fair Tradelocator flyer (download it here). The frustration resulting in the crawling pace of Manila traffic was immediately rub out by spending a day catching up with the Philippine WFTO members! This most recent workshop on Wednesday, July 29 brought all of the Fair Trade members of the Philippines together, hosted by CCAP. Amidst laughs and nibbles on Fair Trade dried mango slices the WFTO-Asia office drove the conversation towards the Guarantee System (GS). The life and works of Antonia Rodriguez Medrano are a powerful metaphor to describe an Agent for Change. WFTO would like to share a brief story of this incredible woman who dedicated much of her life to advancing the conditions of Bolivian indigenous and marginalised populations, historically excluded on all fronts. A tiny state where conflict is not uncommon, but small as it is, Palestine is home to two great Fair Trade organisations passionate about building peace in Palestine through Fair Trade. Three months after Nepal was hit by two major earthquakes, WFTO reports about the reconstruction efforts in the country. We interviewed Chitra Bahadur KC, the director of New Sadle and president of WFTO-Asia, and Chandra Prasad Kachhipati, Chairperson of Fair Trade Group Nepal (FTGN) to give us updates on their initiatives.